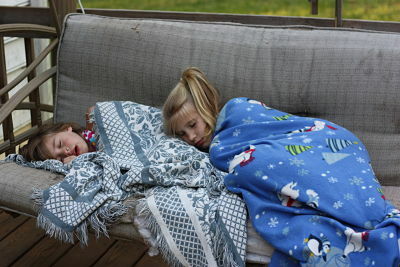 Do you remember those “all nighter” slumber parties as a girl? Do you remember how you felt the “day after”? Well, I think that feeling set in a bit early on our precious blessings. For this Sunday moment, I pray you have time to worship, rejuvenate and relax. Typically, my Sundays are very busy, so I struggle to set apart that time of rest, but I know how important it is. He calls us to Rest…In Him. Enjoy it! Aww… aren’t they just the sweetest! What a wonderful moment to capture! And yes I do remember the slumber party days. We do rest, but not on Sunday! We wait for Daddy’s day off. Rest is what’s important, not the day you do it. oh yes I remember that day after the lock-in or slumber party feeling. yuck.